Please sign me up for Fleet. Please sign me up for Fleet. Thanks. Looks like we need more games at 6:30. I'm going to bring dominion out. 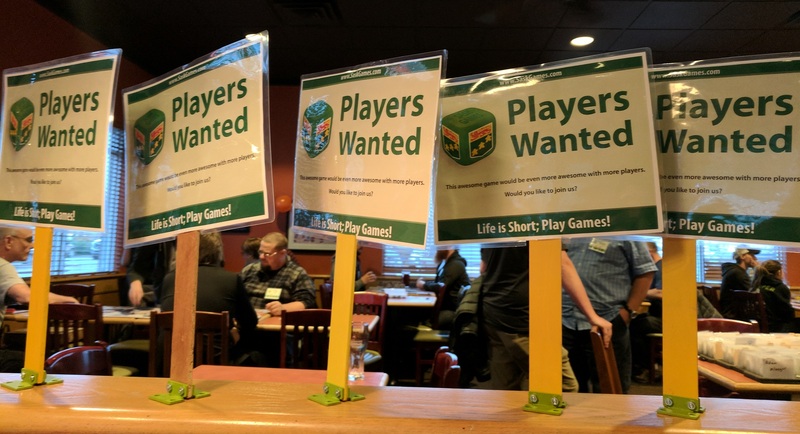 Games Played: Charterstone, Dominion, Carcassonne: Hunters and Gatherers, Sprawlopolis, Keyforge: Call of the Archons, Azul, Puerto Rico, Burger Up, Viticulture: Tuscany, Kingsburg, Fleet, Orcs Orcs, Orcs, and more! - SaskGames fundraises to cover operational costs and web hosting fees. One of the easiest ways for you to contribute is to click the Google Ads at the bottom of our website. The more unique clicks each day, the more dollars! On good days, we can get around $20 and in a month we currently make more than $100. Imagine what we could make with more clicks if just 5 unique clicks nets $6.80. Please help out!